Train Your Pooch - Live Happy! Dog training, puppy training, pets training. Training your pet means a happy pet. 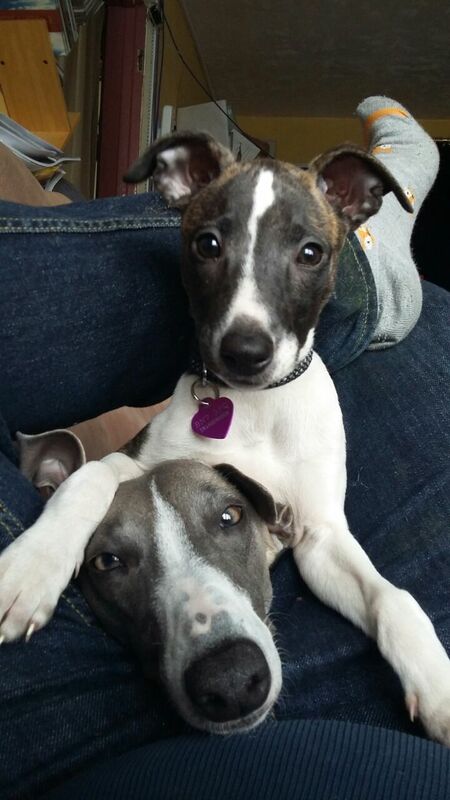 Why Are Whippets So Wonderful? Every day I ask my self that question. There is definitely something very special about these truly amazing dogs. We have two in our house. They are actually my daughter's, but we all love them to bits! (Well, the men in the family don't show it all the time). Daughter and I are besotted with them. Sophie, the older one, is gentle and seems to be incredibly kind - if such an attribute can be given to a dog. She looks after her sister, and he humans. Rosie, is a lovable rascal. More overtly pesky than Sophie, she is also very loving. A year on from getting Rosie, they are about the same size and run as fast as each other - although I reckon Sophie sometimes cruises along so that her sister can keep up. And she does seem to have more stamina too. Such a joy to watch them running. Sophie is a great ball chaser, and being a sight dog, can see the ball even in the gloom of dusk. A very gentle creature with beautiful eyes. Rosie on the other hand, much prefers the chukka handle to the ball. Many's the time we've had to dodge her charging at the back of our knees (not deliberately to knock us over - I'm sure?!?!). Definitely pesky, this little one. Flyball. I must tell you about our whippets and flyball. Sophie was the first to join the local flyball club as Rosie was too young. At first she seemed very nervous, but she had a good go at everything an did extremely well. One-to-one sessions have been amazing, and while she is a nervous dog, she is very, very fast and has the pick-up off pat. Just last week, Rosie had her first flyball lesson - and was truly amazing too. So, now the club has two potential winners on their books. Having said that, flyball is very noisy and we have no idea how they will do in a competition atmosphere, but time will tell. Just a quickie for you today. How to stop a dog barking. "Free Video Reveals 4 Minute ExerciseThat Can Help Your Dog Finally Listen To You...Without Having To Touch, Scold, Or Yell!" I couldn't resist putting this here. Found it when browsing. I cannot buy anything bigger than a king sized bed. I am very sorry about this. Do not think I will continue sleeping on the couch to ensure your comfort, however. Dogs and cats can actually curl up in a ball when they sleep It is not necessary to sleep perpendicular to each other, stretched out to the fullest extent possible. I also know that sticking tails straight out and having tongues hanging out on the other end to maximize space is nothing but sarcasm. I was browsing around and came across this page at GiveUsAHome - not just for dogs either. Does temperament vary much between breeds of dog? Different breeds of dogs have been developed to perform specific tasks (e.g. guarding, hunting, herding), and consequently, as well as developing a characteristic appearance, they also developed variations in temperament. Retrievers and Setters are inclined to be boisterous, but are essentially good-natured and easy to train. Smaller spaniels (King Charles or English Toy Spaniel, and Cavalier King Charles) are very even tempered. Beagles are rather playful and slow at learning, but most have an easy-going disposition. Afghan Hounds, Saluki, Borzoi and Greyhounds often prove difficult to control, particularly if allowed off a lead. Collies develop a strong loyalty to members of the family and are rather wary of strangers. Border Collies have a strong herding instinct and, with nothing to occupy them, can become frustrated to the point of hysteria. Whippet and Shetland Sheepdog are both very good with children and come in smaller sizes. Bull Terrier or Stafordshire Bull Terrier are not to be trusted with strange dogs, which they will usually want to fight, though they are affectionate towards people, including children, and make very good family pets. Smaller breeds are less easy-going, more defensive and inclined to be snappy with children. Corgis in particular are this way and the tendency needs to be firmly curbed early in life. Small terriers are tough, wiry and inquisitive, and certain breeds (e.g. Border Terrier and Boston Terrier) tolerate children much better than others (e.g.Scottish and Yorkshire Terriers). Dachshunds and Chihuahua are inclined to bark a lot if unchecked an Chihuahuas in particular are likely to be bad-tempered with children and strangers. The German Shepherd Dog is the most popular breed in the world and is an excellent working dog, but some individuals are very shy and apprehensive and become aggressive through fear. Boxer is usually a friendly exuberant dog which remains playful for several years, though some animals develop unstable temperaments. Doberman Pinscher and Rottweilers have forceful, dominant personalities, especially the German strains, and should always be well trained and strictly controlled. Great Danes are like young colts, rather skittish and inclined to crash into things. I have my own websites all about dog training, but I really don't mind when I find another site which has lots of content - for starters it gives me ideas for presentation, content etc. There's a lot of info in there - in fact, practically everything you need to know about training your dog or puppy, what to do if it has problems, health, food etc. Maybe you know someone who has a particular doggy or puppy problem. Well, why not copy this blog page over to them so they can visit the site for themselves. Does Your Dog Itch and Scratch, All Night Long? To access the info, you need to subscribe, but you do gets lots of goodies in return and email consulation and membership to the forum and lots more for 30 days. I think this is a really good site and I heartily recommend it. How To Potty Train Your Puppy In 7 Days. Ain't I Cute - Now Train Me To Be Good ! !